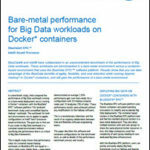 In a benchmark study, Intel compared the performance of Big Data workloads running on a bare-metal deployment versus running in Docker containers with the BlueData EPIC software platform. The study found that it is possible to run Big Data workloads in a container-based environment without sacrificing performance. The benefits include agility, flexibility, and cost efficiency. Data science teams can get on-demand Hadoop and Spark clusters, while leveraging enterprise-grade security in a multi-tenant architecture. Get the white paper to learn about this breakthrough benchmark study. The vision of Hadoop as more than a data store is finally a reality. Thanks to advances from SQL query engines like Spark SQL, Impala, Presto and Hive on Tez, big data technologies are now accessible for business analytics. With Looker, analysts can build a data model across all their data in Hadoop – easily transforming raw data into meaningful metrics and finally allowing business teams to access and explore years of stored data in Hadoop data sets. In this report, Ponemon Institute is pleased to present the findings of Big Data Cybersecurity Analytics, sponsored by Cloudera. In almost every organization, SQL is at the heart of enterprise data used in transactional systems, data warehouses, columnar databases and analytics platforms to name just a few examples. Additionally, a vast number of commercial and in-house developed tools used to access, manipulate and visualize data rely on SQL. SQL is lifeblood of the modern transaction and decision support systems. An organization’s readiness for Hadoop is not a single state held by a single entity. Corporations, government agencies, educational institutions, healthcare providers, and other types of organizations are complex in that they have multiple departments, lines of business, and teams for various business and technology functions. Each function can be at a different state of readiness for Hadoop, and each function can affect the success or failure of Hadoop programs. A White paper by Philip Howard, Bloor Research International Ltd on critical considerations for Hadoop deployments and the role of appliances.